Specially designed tank-mounted chrome housing features a speedometer, odometer / A & B tripmeter and indicator lights for the turn signals, high beam, neutral indicator, oil pressure and coolant temperature. Electric speedometer with easy-to-read classic numerals uses an electronic speed sensor in the transmission, which eliminates the front-wheel-mounted speedometer cable. This contributes to a clean, uncluttered look. Extensive chrome-finishing of engine parts includes cylinder-head covers, valve inspection covers, airbox cover, left crankcase cover, clutch cover and left-rear engine cover. 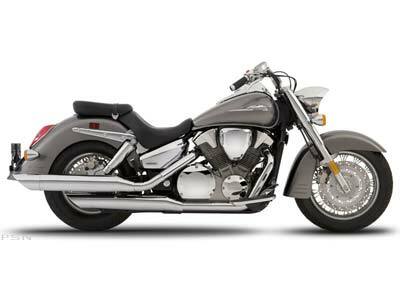 VTX1300C, S and R models feature a stylish chrome tank emblem. Massive tubular steel frame contains the engine's power and gives the VTX a long, low, classic stance. VTX engine is a 1,312 cc liquid-cooled 52-degree V-twin that delivers strong low-end and mid-range torque, with ample power for passing and relaxed cruising. Dual two-axis primary counterbalancers minimize harsh engine vibration without eliminating the powerful pulse feeling transmitted by the VTX's traditional V-twin design. Each three-valve cylinder head features two 31 mm intake valves and a large 40 mm exhaust valve to produce optimum flow for the incoming air/fuel charge. Simple-to-service screw-and-locknut valve clearance adjusters. Two spark plugs per cylinder for efficient combustion at all engine speeds. A unique dry-sump oil system utilizes a closed-crankcase design and places the oil tank inside the gearbox case. The result is a freer-revving engine for improved power and a lower engine height, allowing optimum rider ergonomics and a low 27-inch seat height. 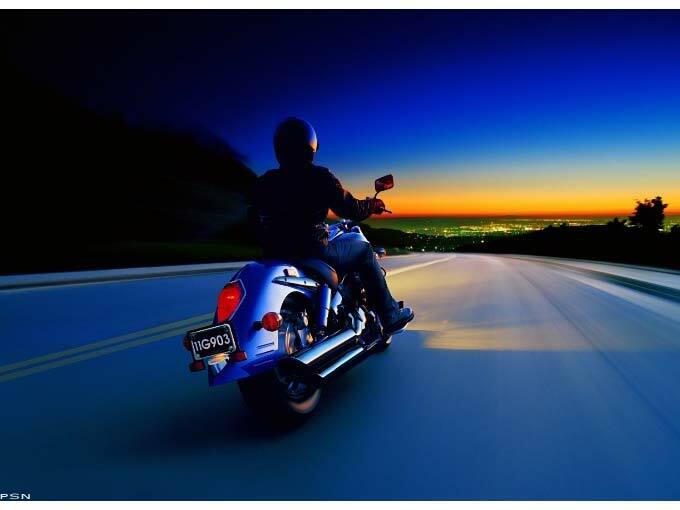 VTX™1300R colors include Black, Titanium, Dark Red Metallic, Metallic Blue. Deeply valanced front and rear fenders, chrome-hooded headlight, broad fuel tank with tank-mounted instruments, semi-swept handlebar and floorboards with heel-and-toe shifter create a classic retro style that sets the VTX apart from the competition. Rider comfort is enhanced with comfortable ergonomics and a firmly padded saddle featuring a low 27-inch seat height. Staggered dual exhaust pipes produce a pleasing, throaty exhaust note. VTX1300R features retro-style cast wheels. Large 140/80-17 front tire gives the S and R models a commanding profile. The black resin seat pan/rear fender located under the seat cowl has been designed to position the battery and electrical components forward for optimum mass centralization.